Armstrong was a civilian on his second spaceflight (he'd previously flown on Gemini 8), Aldrin was a USAF Colonel on his second spaceflight (Gemini 12), Collins was a USAF Lt. Colonel also on his second flight (Gemini 10). The backup crew for this mission was Jim Lovell, Fred Haise, and William Anders. The Apollo 11 Command Module is on display at the National Air and Space Museum in Washington, D.C.
Apollo 11 was the first mission in which humans walked on the lunar surface. On 20 July 1969 Neil A. Armstrong and Edwin E. "Buzz" Aldrin Jr. landed in Mare Tranquilitatis (the Sea of Tranquility). 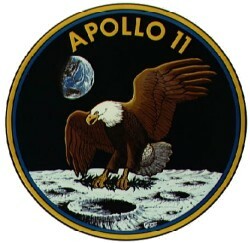 Armstrong reported, "Houston, Tranquility Base here - the Eagle has landed." CM pilot Michael Collins continued in lunar orbit. 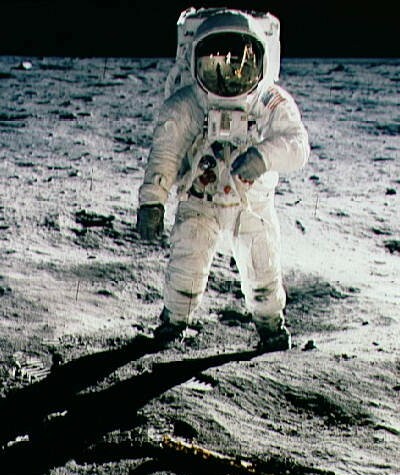 Armstrong stepped onto the lunar surface stating, "That's one small step for man, one giant leap for mankind". Aldrin followed 19 minutes later. The astronauts deployed the ELSEP and other instruments, took photographs, and collected 21.7 kg of lunar rock and soil. The astronauts traversed a total distance of about 250 meters. The EVA lasted two and a quarter hours. 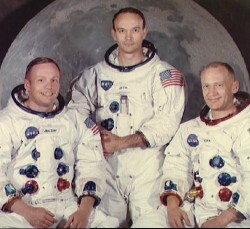 The LM took off from the Moon on 21 July and the astronauts returned to Earth on 24 July. The performance of the spacecraft was excellent throughout the mission. The primary mission goal of landing astronauts on the Moon and returning them to Earth was achieved. Edwin E. "Buzz" Aldrin Jr.